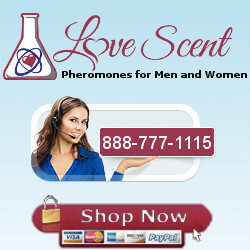 Potentially, human pheromones could be made up of many different types of compounds. We know about fatty acid chains and hormone derived compounds (populating the list below), but proteins and small amino acid chains also have the potential to have some kind of pheromonal action, although these are more likely to be transmitted by touch as they are not very volatile (do not evaporate easily). Pheromone products have so far only dealt with hormone derived pheromones and one specific group of fatty acid pheromones. Very few of them are only found in either men or women; in most cases most of them are present but in different ratios. Clicking on a type if pheromone will take you to a page explaining more about each one, including ideas about what it does to the pheromone products that contain that particular pheromone. Some of the lesser known pheromones have no information pages because of insufficient data. There are now two types of this compound that are used in pheromone products, the alpha and beta isomers, each producing slightly different effects. The alpha and beta have nothing to do with the pheromone projecting an alpha aura. Both seem to cause chattiness and friendliness.